This No Spend June is working out good so far. I've only had to buy the the basics in this week ... Bread, Milk, Sliced ham for packed lunches. Some more Bananas cause Agent M has devoured the previous loaf of Banana bread and is desperate for more. But nothing over and above. Only problem is I ran out of biscuits. Oh Mama ... how could you?! So instead of walking into town again to get some treats to add to the boys lunches, I decided to make something for them. To start with, I'll tell you all my recipe for Basic Vanilla Sponge. For all my cakes I use this basic sponge recipe then add to it any 'extras' I want. In this case Orange. Cream together the butter, sugar and vanilla till its a lovely pale colour. Add in the eggs then the flour and mix together till light and fluffy. *I use an electric whisk cause I think its easier to make it light and fluffy but you can use a good old wooden spoon and beat the ingredients together. The timing on the cakes is really dependent on what your baking in for example, cupcakes will take less time than a round cake. A good rule of thumb is to bake in a pre-heated over (mine goes in 180c) till golden brown (always doing the cake test - insert a skewer or knife to the biggest part of the cake and if it comes out clean, your good to go). 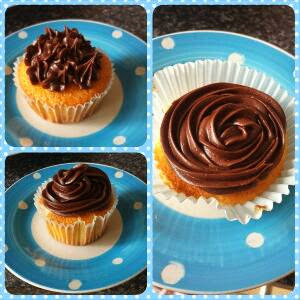 A general approximation is 10-15 minutes for cupcakes and 25 - 30 min for a large round cake. This mix makes about 12 cupcakes. The only thing for these cakes you need to add is Orange ... the juice of two oranges and the zest of one to be exact. Once your happy, dish out into your preferred container and bake till lovely and golden. Place the chocolate and the butter in a glass bowl and place over a pot of boiling water. Stir till its all melted. *In theory you could melt the two in the microwave together but I've never tried that when making icing so I cant say how long it would take. 10 second blasts would be my best bet. In a large bowl, mix the icing sugar, Vanilla (if using) and 120ml of the milk then gradually add in the chocolate butter mix. Add in the rest of the milk bit by bit until you get it to the thickness you want. I recommend having it thick enough to hold over your head without pouring out if your wanting to pipe the icing. Other wise its gonna be too runny. I always have a little milk left but the amount changes depending on the cake I'm making. I like it thick for cupcakes and a bit thinner consistency to go in a large cake.